The world transportation sector is a major source of carbon dioxide emissions, heat trapping gas that warmed up the Caribbean and contributed to the ferocity of the 2017 hurricane season. Puerto Rico, St. Martin and other islands have been wrecked and Houston suffered a major flood. This situation will only worsen if we don’t stop burning fossil fuels like coal, gasoline, and natural gas immediately. Imagine a hurricane season 10% worse than this year’s! Worried about Chinese competition (and remaining competitive in the growing Chinese and Indian markets), worried about quotas like those being imposed by California, and worried about the mood of the consumers after this year’s hurricanes, some auto executives are going green. Already, in the first half of 2017, 5% or 1 in twenty new car sales in California has been electric. General Motors has announced that they will have 20 electric car models on the road by 2023! And the company will introduce two new EVs in the next 18 months. GM is an aristocrat of the old order but it has decided to play the role of a revolutionary. Ford is also developing the Edison group of EVs for its buyers. 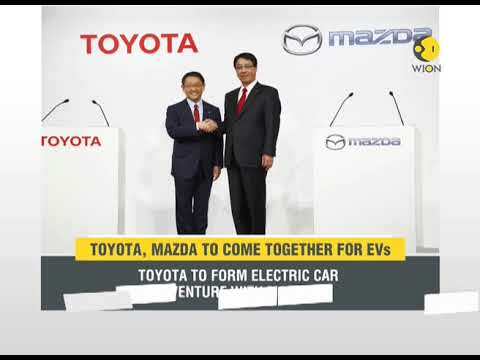 Nissan has brought out a new Leaf EV with a range of 150 miles, and Toyota and other Japanese auto manufacturers are planning electric cars (see video below). Of course China and Elon Musk and Tesla deserve a good deal of the credit here. Without their ambitious plans and the prospect that the Big 3 would be stuck trying to sell dinosaurs to the environmentally conscious Millennials, maybe Detroit would not have swung into action so quickly. China’s EV sales are up 68% this year, and some canny observers don’t expect purely gasoline cars to have a market in China after 2029. General Motors already has the Bolt, which is in the same class as the Tesla 3– an electric car for people who can spend $35,000 on a car. But this generation of EVs gets more like 220 miles to the charge, and charging is faster, rather than the 40 miles to the charge that was common 4 years ago. Can an even cheaper and better EV be far off, given the incredible rate of technological innovation in this field? We are just waiting for the electric Model T, the $10,000 compact that goes 500 miles on a charge and charges in 15 minutes. Inventor James Dyson is throwing his hat into the ring. That is a $2 bn hat. Of course, electric vehicles only save the world if you generate electricity for them with wind and solar and hydro. In California, Iowa, Texas and Colorado, that transformation is advanced. But families don’t have to wait for the government in this regard. We can put solar panels on our roofs if we own a home, and lobby our utility for green energy if we don’t. (But even in dirty coal states like Pennsylvania, studies have shown that electric vehicles are less polluting than gasoline cars). The transformation is coming, and coming quickly. Remember, in 2004 there were no iPhones or really smartphones. Now there are billions around the world. Electric vehicles will be like that. The world is going to heat up. But we have a choice whether it heats up 4 degrees F. or 12 degrees F. You wouldn’t like a 12 degrees F. increase. Ask any Puerto Rican.